Backwards compatibility is completely maintained between editions. You can use 2nd Edition expansions with your original edition core game, and vice versa. The 2nd Edition core game has a sturdy new telescoping box, while 2nd Edition expansions have double-width tuckboxes. Timing icons in the style of Cthulhu Gloom and Unquiet Dead are incorporated throughout the 2nd Edition. Rules cards and icon reminder cards are included in each 2nd Edition set for easy reference. The card list, and the effect texts of individual cards, have been polished for a better play experience. For example, complex cards like "Body Thief," and cards with delayed effects, have been removed. Three Modifiers have been turned into Transformations in Unwelcome Guests 2nd Edition. Residences and Mysteries have been reworked in the 2nd Edition so that you can no longer end up with unusable cards in your hand. All the Story icons and a few family icons in the 2nd Edition have been redrawn by artist Todd Remick. 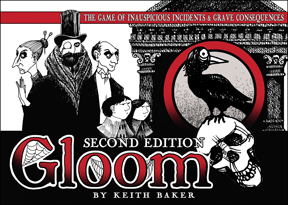 Gloom 2nd Edition uses the discard rule from Cthulhu Gloom. Horror icons have been removed from the 2nd Edition, to save them for Cthulhu Gloom. Death cards in the 2nd Edition have a central art piece, as Cthulhu Gloom does, as well as a blank Story icon at top right. Characters no longer flip upon death. Event cards in the 2nd Edition have a center illustration and a blank icon in the top right spot, to give them the same silhouette as a Death card. Guests in the 2nd Edition have reminder text in the family icon spot, as Cthulhu Gloom does. "Pathos Points" are now called "Self-Worth Points," to avoid unnecessary proliferation of game terms. A number of mechanical changes have been made in the rule sheet. For example, timing icons, symbols on Event cards, and the new discard rule have been accounted for.